Égalité des sexes et fécondité: existe-t-il un lien? In the last decades, researchers have suggested that gender equality may have a positive effect on fertility in high-income countries. While this conjecture appears to be true cross-sectionally, it does not seem to work longitudinally (same country over time), as Martin Kolk shows. There is still no clear understanding of what happens to fertility when countries move towards greater gender equality. Demographers have long theorized that gender equality may be one of the determinants of fertility in both low- and high-income societies. In the 20th century, most researchers thought that as women got wider access to education and the labour market, more of them would choose to have few or no children (e.g., Lesthaeghe, 1995). Indeed, across the world in the 20th century, fertility was much higher in societies with low gender equality (Figure 1). However, in the last decades this association has apparently switched to its opposite: among developed countries, fertility is now higher in societies with higher gender equality, such as Scandinavia (Figure 2). A few researchers have recently theorized that the relationship between gender equality and fertility is U-shaped: higher gender equality may reduce fertility at first, but eventually encourages it. This is explained by the fact that in post-industrial, high-income gender-egalitarian societies women do not have to choose between family and career, and family-friendly policies are more common (Esping-Andersen 2016, MacDonald 2000, Goldscheider, Bernhardt and Lappegård 2015). Such ideas are becoming widespread, not only in social science, but also in mainstream media such as the New York Times. 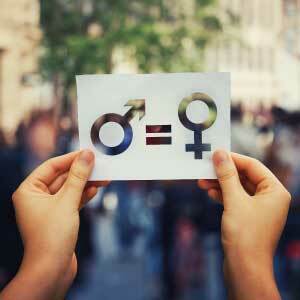 Greater gender equality leads to higher fertility. Does it really? In a recent study (Kolk, 2019), I examined whether gender equality in a society is indeed related to fertility, but I tackled the issue from what I believe is a new perspective. 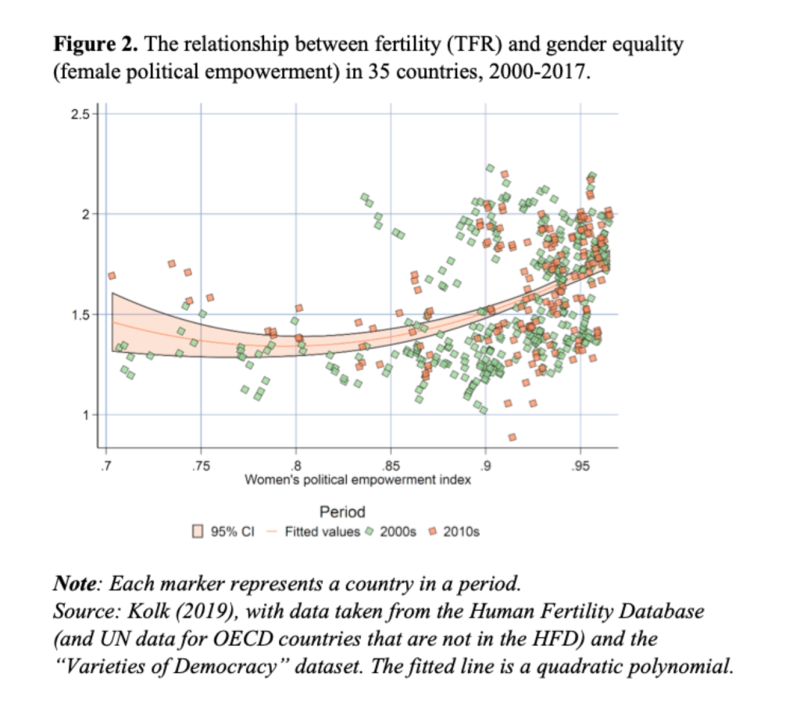 I tested this relationship by examining how fertility (TFR) has evolved with gender equality (female political empowerment) in 35 countries over the 20th century. 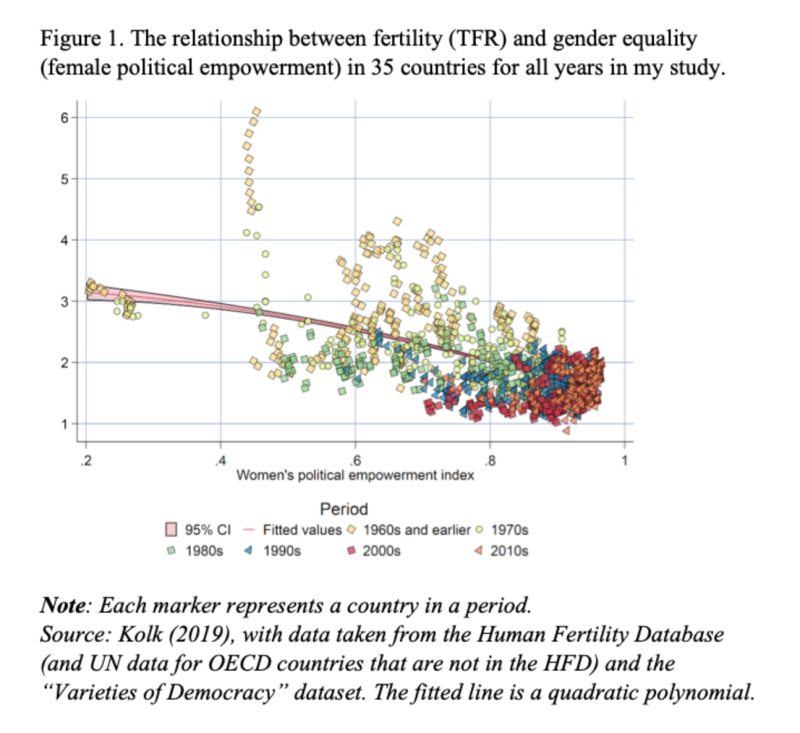 Cross-sectionally, my findings did not differ from those of other scholars: since 2000, societies with greater gender equality have also had higher fertility (Figure 2). However, I also checked whether the same pattern emerged when examining the relationship between fertility and gender equality over time within a country. And, contrary to much of the previous literature, I could not detect any such a pattern. It is true that when gender equality first increased, back in the 1960s and 1970s, fertility also fell, but later on I found no relationship between the evolution of gender equality and that of fertility. 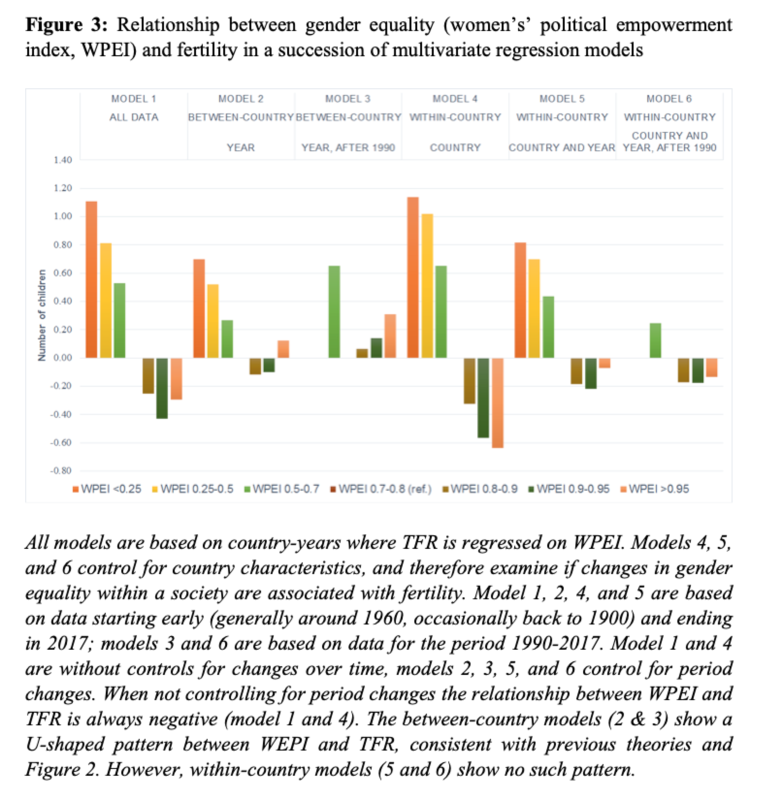 This conclusion (no relationship between the two trajectories of gender equality and fertility when gender equality is high) is robust: it is shown for each country descriptively in the article, and tested in a series of regression models shown in Figure 3. While very low gender equality is usually associated with high fertility (likely because in such societies women are largely confined to the private sphere, i.e., they are primarily housewives and mothers), high gender equality may come in several different shapes, and the associated fertility may be low or (relatively) high. Of course, this may also depend on variables that are not controlled for by my measure of gender equality, such as the extent to which the cost of childrearing is socialized, for example through a generous family policy or subsidized public day care. My study is an example of a relatively common phenomenon in the social sciences: a pattern appears in cross-sectional analyses (different countries observed at the same point in time), but the same relationship does not emerge when studying a single country (or a group of countries) over time. In northwestern Europe, for instance, gender equality has improved massively in the last 50 years (as it has in most other countries in the world), but fertility has not increased. This is not to say that the two variables are necessarily independent of each other; simply that their true connection is probably more complex than most observers, including demographers, tend to believe. Esping-Andersen G. (2016). Families in the 21st century. Stockholm: SNS förlag. Goldscheider F., Bernhardt E., Lappegård T. (2015). The gender revolution: A framework for understanding changing family and demographic behavior. Population and Development Review, 41(2): 207-239. Kolk M. (2019) Weak support for a U-shaped pattern between societal gender equality and fertility when comparing societies across time. Demographic Research, 40: 27-48. Lesthaeghe R. (1995). The second demographic transition in Western countries: an interpretation. In K.O. Mason and A.-M. Jensen (Eds. ), Gender and family change in industrialized countries (pp. 17-62). Oxford: Clarendon Press.